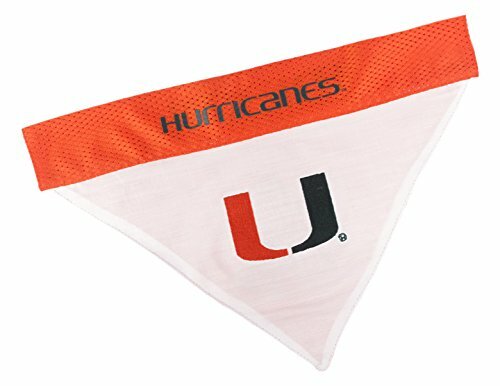 Your pet will surely be able to show off his/her team spirit with this unique dual sided COLLEGE DOG BANDANA! It features a screen printed team logo and name on 1 side & a embroidered team logo on the other side! Officially licensed and ready for game day! Comfortable 100% poly-cotton keeps it wrinkle free and easy to clean. Great for parties, BBQs, tailgating and even Halloween as a pet costume. SIZING & USE: Two available sizes will fit most dogs, including small dogs, medium dogs and large dogs. Please measure your dog before ordering to ensure you get the right fit and avoid any need for a return or exchange. Best fit if used with our matching COLLEGE DOG COLLAR! TEAMS - Available teams include: Alabama Crimson, Arkansas Razorbacks, Arizona State University Sun Devils, Auburn Tigers, Clemson Tigers, Connecticut Huskies, Duke Blue Devils, Florida Gators, Florida State Seminoles, Georgia Bulldogs, Iowa Hawkeyes, Illinois Fighting Illini, Indiana Hoosiers, Iowa State Cyclones, Kansas Jayhawks, Kentucky Wildcats, LSU Tigers, Michigan Wolverines, Miami Hurricanes, Missouri Tigers, Michigan State Spartans, Mississippi State Bulldogs, NC State Wolfpack, Nebraska Cornhuskers, Ohio State Buckeyes, Oklahoma Sooners, Oklahoma State Cowboys, Oregon Ducks, Penn State Nittany Lions, Pittsburgh Panthers, Purdue Boilermakers, South Carolina Gamecocks, Syracuse Orange, Texas A&M Aggies, Tennessee Volunteers, Texas Tech Red Raiders, Texas Longhorns, Louisville Cardinals, Mississippi Ole Miss Rebels, USC Trojans, Utah Utes, Virginia Cavaliers, Virginia Tech Hokies and Wisconsin Badgers. Choose your team and click ADD TO CART NOW!. NCAA Officially COLLEGE licensed. Don't be fooled by other unlicensed, lower quality products. This DOG BANDANA features the TEAM LOGO and bright colors of your favorite COLLEGIATE TEAM! REVERSIBLE - 2 sided PET BANDANA, you can rotate the design your PUPPY wants to wear! 1 Side is a MESH BANDANA with screen-printed LOGO, & 1 Side is Poly-cotton with a premium embroidered TEAM LOGO! GAME DAY - This awesome SPORTY BANDANA is an adorable way to include your pet during game day. It's also great for tailgating, barbeques, Halloween, and other parties! SIZE - Available in 2 SIZES; Small/Medium Bandana: 9.5" x 6.5". & Large/X-Large Bandana: 14.5" x 9.5". Available in 50+ COLLEGIATE TEAMS, Choose your team and click ADD TO CART NOW!